Teri established her studio at the renowned Cockpit Arts Studios, London in 2006. Trained originally as a Graphic Designer she retrained as a jeweller at Kensington & Chelsea College where she drew on her childhood love of all things textile, kindled by the treasures of her mothers sewing room. Her signature crochet and knitting techniques use precious metal wire less than a millimetre thick. Fluid lines and sinuous curves emerge, adorned with stitches of silver and gold. Rich textures reflect pinpoints of light. Capturing tiny diamonds in individual stitches, she transforms strong, hard metal into unexpectedly soft, sensuous forms that inspire wonder and beg to be touched. 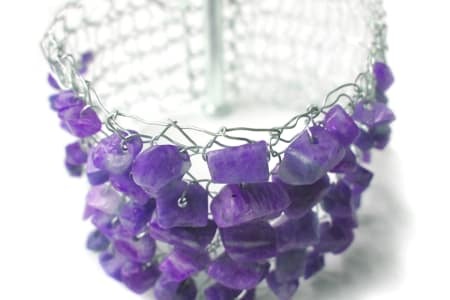 Her jewellery redefines the art of crochet for the 21st Century and is entirely handmade with a conscious rejection of mechanised jewellery production. Making by hand is her quiet, gentle rebellion against today's world of instant everything. She says of her work: "Working with antique crochet hooks, found or donated, I feel connected to previous generations of crocheters. 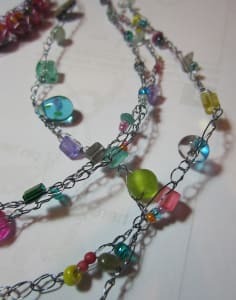 Having run my own crochet jewellery classes for the past ten years and through my annual courses at West Dean College, I have taught over 400 people to crochet, breathing new life into this historic pastime". Nestled in the heart of Bloomsbury, Cockpit Arts is one of London's best kept secrets. Tucked just behind Gray's Inn Rd, this much loved, warehouse building is host to around 75 extraordinary makers, each selected by a rigorous application process. From her studio Teri runs a series of one-day workshops teaching the specialist wire techniques she has mastered in her eighteen years as a jeweller. 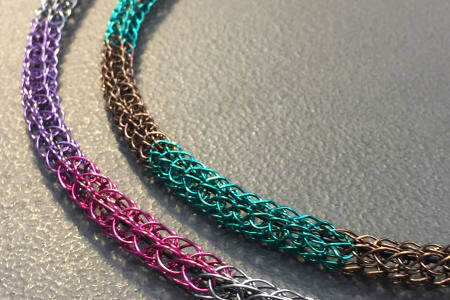 Classes include 3 different levels of Wire Crochet techniques as well as French Knitting and Viking Weave. 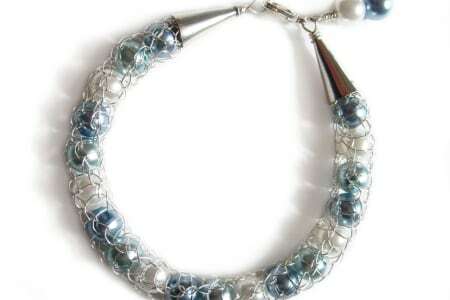 Each project has been designed to produce a completed piece of jewellery in a day. Had an amazing time in this workshop. Teri is the loveliest and most knowledgeable teacher I’ve met, and thanks to her I learnt a totally new skill - even though I’ve made jewellery in the past this is a whole new technique that looks so impressive. Also it’s a great venue - so central and spacious!